Certificate Upon Completion: Upon meeting the assessment components for each course level a completion certificate will be issued from SCA and iTeachU. For individual subjects a statement of activities will be issued. If four individual subjects are completed from one level a certificate of completed will be issued. The SCA-On-CUE subject 1 tutorials form the building block for later subjects within the course. Subject 1 offers an overview of anatomy, physics, transthoracic and transesophageal echocardiography as well as artefact generation. SCA-On-CUE subject 2 outlines the technique of using ultrasound to guide percutaneous procedures. Procedures will include vessel access, nerve blocks, and trauma-related procedures. 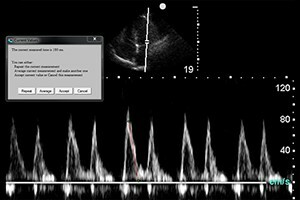 SCA-On-CUE subject 3 introduces Doppler Echocardiography to complement basic transthoracic echocardiography imaging. SCA-On-CUE subject 4 expands the knowledge of transthoracic echocardiography by learning pathophysiology and assessment of ventricular function, including in diastolic function.